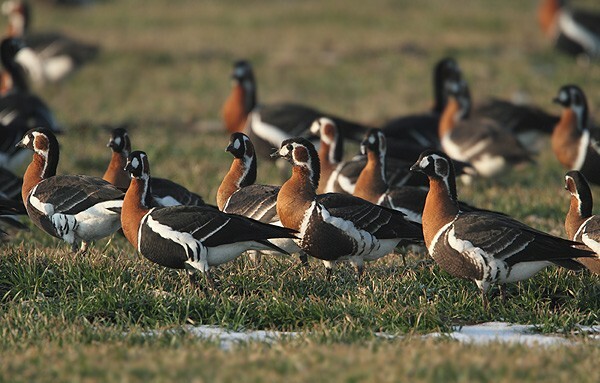 The first Red-breasted Geese for this winter season were recently observed over the Danube wetlands in northern Bulgaria. Very soon we expect them to arrive to their traditional wintering grounds at Durankulak and Shabla Lakes in north-eastern Bulgaria. The Red-breasted Goose (Branta ruficollis) is the smallest wild goose and in the same time the most endangered due to its low numbers and the adverse impact of a number of factors. The birds breed in small groups on the Taimyr, Gida and Yamal Peninsulas in Russia. They begin their autumn migration in early September and the end of the month the birds have already reached Kazakhstan. Some of them continue south to the Aral Sea, but most of them are heading west, and 80-90% of the population concentrates in the wetlands on the north-western coast of the Black Sea, and more specifically in the region of coastal Dobrudzha in Bulgaria and Romania.